So, as a project studio, owned by someone who records, mixes, and masters “on the side,” I’m often approached by artists who are looking for a deal – which sometimes means they expect free service. In many instances, these are friends, or friends of friends, and in some instances they are really good artists – the kind I’d love working with! There is a part of me that would love to do this free of charge. I love what I do, and I love helping others achieve their musical goals. Early on, as I was “working on my chops” I did a few free projects – which took some of the pressure off and helped. When I listen back to some of those projects, I’m glad I didn’t charge! As I got better, I found myself 50-75 hours into a project, listening to an artist ask me to “tweak” something (which sometimes would take several hours) and saying to myself: “I’d feel a lot better about this is I were getting paid!” True enough. The fact is that many artists are unaware of the amount of time it takes, beyond tracking time, to get a project mixed and finished – even if it’s just vocals and guitar, or a few tracks of audio. Tracks have to be cleaned (gated or “stripped” of noise between clips of audio), de-essed, de-breathed (fixing loud breaths), equalized, sometimes compressed, automated as needed (louder in some spots, softer in others), run to busses, etc. etc. And even if a song is recorded in series with nothing changed, all of this has to be done differently for each song. In other words, a separate file has to be created for each song – and all of these steps done for each song. All of this adds up to TIME. So about 10 years ago I started charging for my services. In my humble opinion, I’m still “a steal” if you compare my work to comparable work. And at this time I mostly charge by the project, rather than by the hour, which allows me to be the laid back guy that I like to be in the studio – and not to worry when I’m a little slower than some (perfectionist that I am). Ok. A small post about my mixing philosophy. Pretty simple – I’m not a mastering engineer. Every time I go into my brother’s audiophile listening room, with its $70,000 worth of speakers, preamps, amps, acoustic treatment, etc., I realize that mastering is not the first element in my game. I don’t have the rig. Its a different art entirely from mixing. That doesn’t mean that I don’t do it! I’ve got good software for it, and a fairly good ear for the job. But I’m not going to tell you that I can do what a boutique mastering house can do with several hundred thousand dollars worth of gear. 1. Whether I’m mastering or sending it out, I provide a final mix that is mastering friendly. Even if the client is not going to pay for mastering, I don’t just assume that I should slap a mastering plugin onto the mix and pump it up. I’d rather that the client listen to a well mixed CD than one that is sloppily mastered, or crammed into the Procrustean bed of someone else’s mastering “preset.” That doesn’t mean I don’t use mastering plugins – but I use them to achieve mixing ends – centering bass frequencies on live mixes, multi-pressing frequencies to add more punch or presence, etc. 2. I try to listen to my final mixes on lots of equipment – car speakers, mid-field monitors, near-field monitors, 2.1 computer speakers, etc. I figure if my mix translates pretty well, then if the client doesn’t pay to have it professionally mastered, at least it will sound good in lots of contexts. 3. I try to listen to my final mixes (and masters) on at least one audiophile system – just to tweak it with all the audio information I can, and with the best soundstage possible. My brother lives in Denver – and I have been known to haul my computer and Apogee Mini-Dac into his listening room when visiting him, spending a few hours with whatever projects I have going. It helps. I have a couple of other options nearby. 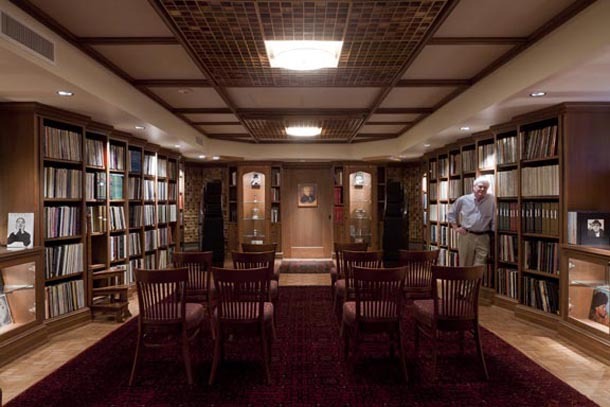 Near my home, a new listening room has just been installed at The University of the South, Sewanee, TN. It’s called the Ralston Listening Library. The guy who runs it is Tam Carlson, one of my English Professors when I was a student there years ago. He’s a music lover. When I was a student in the 70’s we used to go to his home and listen to old Toscanini vinyl albums on his electrostatic speakers. Amazing! Last time I was up there, he told me he’ll log me a few hours in the room if I call ahead. He might do the same for you. Here is a picture of Tam hanging out in this amazing room. For a great article about this listening room, and more great pictures, check out Stereophile. 4. Finally, I leave as much space in the mix as I can. By this I mean that I don’t hyper-compress the audio – even if it is Heavy Metal. When I bounce the final mix, I don’t want my gain structure and compression to leave the transients looking flat as a doornail. I leave at least 3 db. of headroom overall, and work for clean gain throughout the chain, with no tracks overly compressed or pumping. I focus on building a luxurious stereo soundstage and on getting the kind of sonic palette that works best for the project. In the end, however, I want a good mastering engineer to have something he or she can work with, adding the kinds of finishing touches that only they can add. If I squash out all of the gain, or over-compress, there’s nothing a mastering engineer can do. What I’m trying to say is this: “to thine own self be true.” I’m a recording and mixing engineer. 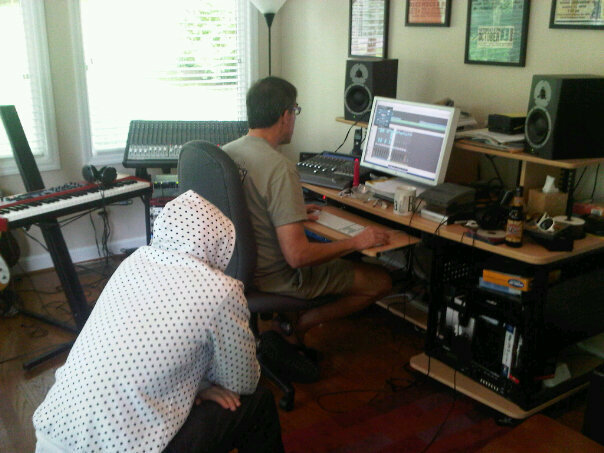 And I mix in a way that lets the mastering engineer do his job (even if that happens to be ME). Here’s my simple philosophy for keeping expenses down: CONTROL YOUR GEAR LUST! 1. Computer. You need a good computer – at least a dual core Intel machine. Two drives: one for your DAW software (Logic, Pro Tools, Cubase, etc.) and the other for your tracks. I’ll have more to say on this another time. 2. DA Converters. You need HIGH QUALITY analog to digital converters. This is one place not to scrimp! The biggest different in your sound happens here – with converters (and digital clock). I use the Apogee AD16x (I sometimes need 16 simultaneous tracks for live tracking) – now replaced by their Symphony system. In order to get the least possible latency, I use the Apogee Thunderbridge and X-symphony card in order to be able to use the thunderbolt in/out on my computer. Get something comparable (Lynx, or UA Apollo). You won’t regret it. 3. Preamps. Next in the food chain are your preamps. Here, the marketers go wild. Since preamps add color and texture to the sound on the way in, helping with the often brittle quality of digital recording, you’ll be tempted to get all kinds of preamps. What you NEED, however, is at least one really good clean or transparent preamp, and at least one more colored preamp (tube or heavy transformer based). You might also get two or three “channel strips”. A channel strip includes a good preamp, a good equalizer, and a good compressor/limiter. The ability to bypass the equalizer and/or compressor/limiter is an important feature. You won’t always want these in the chain. For clean/transparent pre amplification, I like the True Precision preamps. I bought the True Precision 8, which includes 8 channels, since I sometimes record bands. It gives me 8 great channels for a drum kit, for instance, and at a good price point. Other great transparent preamps are Grace preamps, but they tend to be a little pricier per unit. A very nice, inexpensive tube pair of tube preamps, if you can find them, are the Peavey VM-P-2s. I got a pair used and love them. Another good set of used preamps is the Presonus MP-20. I get good workhorse time out of mine. On the channel strip side, you might get a non-transformer strip, a good transformer-loaded strip, and a good tube strip. For a little tube flavor to warm things up, perhaps the best price for the money for a “money channel” is the Universal Audio LA 610 MKII. I use mine all the time, especially for vocals. Another good workhorse choice is the Avalon VT-737sp. For a good budget minded non-transformer channel strip, think about the Presonus Eureka. I use mine regularly. The preamp is fast and transparent, the compressor adequate for most projects, and the eq is very clean. For a transformer-based strip, you can’t do better than the Focusrite ISA 430 MKII. It takes a while to learn (due to its many, many options), but simply sounds fantastic on just about everything – especially bass! I use mine all the time. 4. Hardware compressor/limiters. If you are multi-tracking, you may never need these, but it is a good idea to have a couple on hand to tame transients on the way into the box. You could spend a bundle here, but I wouldn’t. I like the FMR audio RMC1773 “Really Nice” Compressor. Tremendous for the money, and I’ve never had a studio situation – drums, bass, BGVs, etc. where they didn’t do the trick if I needed them to tame a signal. Large Diaphragm cardioid condenser. First, you need a good large diaphragm cardioid condenser microphone for capturing vocals, drum overhead, etc. How good? Well, despite what you might be led to believe, you can get good professional recordings with less than you think. I have come to love quality and versatility of the Neumann TLM 103. This is a very straight forward, quiet, clean microphone with tremendous handling of sound pressure levels (spls). There are lots of other great choices here that won’t break the bank. The Mojave MA-200, MikTek C7, Shure KSM44A, or AKG C414XLS will all do the trick for about the same price. Stereo Pair – Small Diaphragm Cardioid Condenser. Second, you need a good stereo pair of small diaphragm cardioid condenser microphones for capturing a range of acoustic instruments – mandolin, fiddle, banjo, acoustic guitar, choirs, ensembles, etc. These are also good for cymbals. Many studios make use of the Neumann KM 184 matched pair. I find these to have a tiny bit too much of a high end spike for my taste, which doesn’t make them versatile enough to handle some instruments – like the fiddle. I now use the MikTek C5MP and love them. The high end is not brittle, but smooth and easy to eq. I also like supporting the local economy. These great sounding microphones are made in Nashville. Dynamic Microphones. Third, you need a few workhorse dynamic microphones. These are especially good for recording drums and guitar amps and cabs. I grew up on Shure Sm-57s for these tasks, and I’d strongly recommend looking into the Shure DMK57-52 drum microphone kit. You’ll get three SM57s, and a Beta 52 for kick, along with a nice case and drum mounts. The Beta 52 is a great kick mic, and can also double when you multitrack the bass amp with good results, and does surprisingly well also on double bass. For bass amp miking and for some vocal applications, it is also good to have an Electrovoice EVRE320 on hand. A great mic for the money and a real workhorse. A Ribbon Microphone. Finally, it is a good idea to have one ribbon mic in the closet. Some instruments and vocals just have too much high end bite, and only a ribbon mic can get them under control. And from time to time you’ll want to reach for a mic that will provide that dark vintage vibe. Also, ribbon mics have a figure 8 pattern, which can be helpful in many applications, especially when you want to capture room ambience. Typically these are expensive microphones. Its hard to beat a Royer R-121 for versatility. The AEA R84 is great. If I need one of this quality, I usually head downtown and rent one for the day (about 60 bucks). In my closet, however, I have the very affordable Cascade Fathead II. For most applications, it is more than adequate – great for the squeaking violin or the room mic. And a good guitar amp mic as well. For as often as you’ll probably need a ribbon, this should be enough. I also get great use out of my very affordable Cascade X-15 stereo ribbon mic. I have a very active sounding drum room, and this is a great room mic for stereo miking drums in such a room. It is also lovely on guitar in some applications. Ok. Granted there are lots of other choices and occasional needs – omnidirectional, tube condenser, etc. And you can keep adding on. The basics, however, are mostly cardioid mics – condenser and dynamic, and the occasional ribbon. Home recordists usually have room issues. These are often over-stated by product marketers, however. In today’s world, you’ll be doing a lot of close miking, and the room will not present huge issues. Even drum miking can be fairly well controlled in rooms that are not perfect. 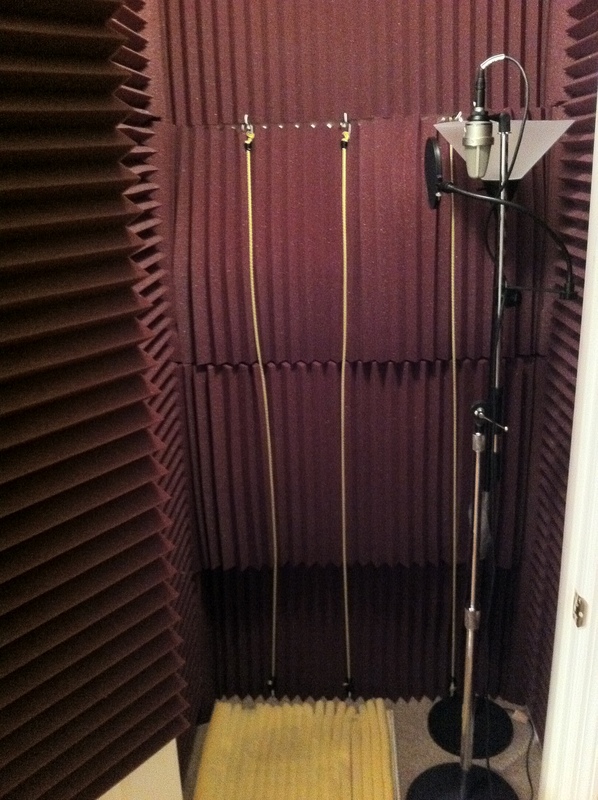 On the room-prep end, I’d recommend that you grab a closet and turn it into a vocal booth if you can. This will be your main need in terms of room issues. Here’s mine. And purchase one of several great new products for controlling room reflections. I use the SE Reflexion Filter when recording lots of instruments, and for some vocal applications – a first rate product. The Auralex ProMAX is also great and very versatile. Two of these will be all you’ll need to control most room issues. That’s it for gear in the recording/tracking chain. You don’t need more than this to get professional quality recording going at home. I’ll blog another time about studio monitoring equipment and recording software and plugins to consider. Again, the philosophy is, and will be, the same – Control Your Gear Lust! As I mentioned in the “About” page, I have four reasons for posting this blog. First, in the section entitled Recent Projects, to (gently) advertise my project studio. I try to record 5-6 projects annually, and would be glad to discuss whether what I do is appropriate for your project. From time to time, therefore, I’ll post links to music recorded in the studio so that you can get an idea of what I can do. Second, in the section entitled Philosophy, to share my philosophy of recording. Third, in the section entitled Tricks of the Trade, to share ideas that I have about improving both the workflow and quality of project studio recordings. Fourth, in the section entitled Gear, to discuss gear I have used or found useful in studio production. For over thirty years now I’ve been recording and mixing music. No, it’s not my “day job.” I teach at Vanderbilt Divinity School. I write books on all kinds of topics. I’ve also been known to blog on a range of topics – in particular preaching and worship, and popular religion. My passion for recording music intersects with my other interests – which focus on the philosophy and impact of sound and words in the public arena. My life in recording began in my teenage and college age years, in Birmingham, Alabama. I worked for a film company (Metcalf Productions), writing soundtracks (mostly music) for commercial films and television spots. I hung around the studio as much as I could, learning the basics of microphone placement, mixing and editing. Studio Engineering was not how I wanted to make a living. I had other interests oriented toward scholarship and teaching. But music performance and recording remained my primary hobbies – and soon became a bit more than that, as computers began to make recording more accessible for hobbyists. With the advent of computer-based digital sequencing in the 80’s and then the full-blown marketing of digital audio workstations (DAWs) in the 90’s, home recording leapt to new levels, and became more accessible to hobbyists. I began editing on the German based software Emagic Logic in the mid-90s and stuck with it when Apple bought the company and morphed it into Logic Pro. I have stayed with Logic, and have found it to be more than adequate for most forms of studio production. Moving to Nashville in 2004 changed the whole game for me. Nashville is filled with commercial and boutique studios, and hundreds of project studios (good and bad). At the same time, hundreds of artists move to Nashville each year in order to try to make it in the music industry as either songwriters or performers. The number of people needing good quality demo recordings or affordable project recordings is many times what it is in most cities. And there is a small niche for those of us who can provide a product that is less expensive yet well recorded and mixed. I’ve steadily increased the number of projects I take on. My connections with excellent musicians (for hire), gear rental and other music resources has sky-rocketed in the past three years. Although gear is important, as you will see in later posts, I believe that the key to recording and mixing is the ear, not the gear. Some of my favorite recordings were made on an old Tascam cassette Portastudio I owned in the late 80s, using mostly dynamic microphones. Training one’s ear to create a good sound and mix is the key to recording at any level. More on this, and other aspects of the game, later. Welcome to the blog. Hope you enjoy it and get something out of it.